"Vividly evoking the natural world and that most complex of beasts, the human, who stumbles and dances through it, Robert Wrigley's ninth collection of poetry is a quietly illuminating and richly pleasurable read. He deftly joins story and song in these moving, wry, thought-provoking poems." "The story couldn't be simpler: as you lie down to sleep, your dream animal appears to whisk you off to slumber. Not so simple is the sweet menagerie that does the whisking: bats and narwhales are among the animals that take the reader off to lunar landscapes and mermaid grottoes. Like Goodnight, Moon or any number of childhood favorites, this is a book you'll still love after the umpteenth reading. An instant classic." "This essential book's power is revealed in it's unique format. Printed on accordion-style paper to reveal 24 drawings that fold out to depict the first day in the Battle of the Somme, Sacco's black-and-white illustrations show the horror of the war by drawing us into details of the battle. 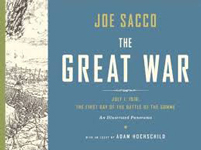 Inside the endless winding trenches, nearby the constant explosions, and oddly both distinct from and very much a part of military regiment and routine, Sacco beautifully renders the devastation and human toll of the war." "Intrepid writer, naturalist and foodie Langdon Cook takes us along on his journey into the often secretive world of mushroom gatherers and dealers on the West Coast. Cook is marvelous company--bright, inquisitive, and up for an adventure. This revealing volume is part memoir, part social study, part nature guidebook, part recipe collection, and completely compelling. You'll never look at a chanterelle the same way again." "In her newest work, she revels in Tokyo teen culture--this goes far beyond Hello Kitty--and explores quantum physics, military applications of computer video games, Internet bullying and Marcel Proust as well, all while creating a vulnerable and unique voice for the 16-year-old girl at its center…. Ozeki has produced a dazzling and humorous work of literary origami." "Reading his short stories--a diverse lot, but with a strong dose of the down and almost out--it's easy to envision that you're meeting the people who stream by Walter's house. The tweakers, the cons, the people always two dollars short--they're all there, and in this book they're all here, in stories that twist and plumb, delivering unexpected laughs while playing with what it is we think we know."